Since the launch of the portable VR-device "Google Cardboard" we're no longer required to sit attached with wires to a computer. Nor do we need complicated hi-tech to simulate 'real world experiences'. We can now simply walk out the door to let city sounds enrich the VR experience with a live ambience and a natural sense-of-place! This website will be dedicated to indexing Google Cardboard VR content suitable for outdoor use, categorized based on the optimal physical world circumstances to enrich the virtual experience. 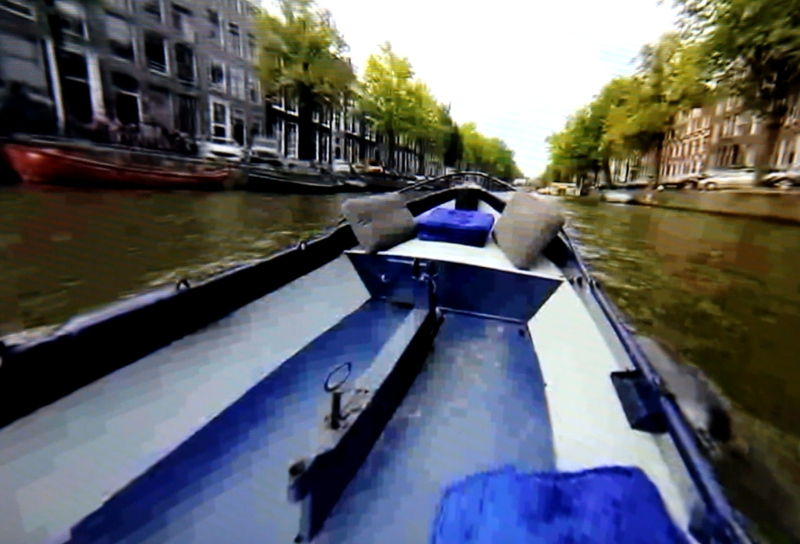 Oculus VR brings the world to you, but Google Cardboard puts VR into the world! For example: when you have a tandem-bike, download "Hang Gliding" app by i-mmersive. Go to an area with enough possibilities to make turns, as this mimmicks the experience of Hang Gliding most optimally. Cyborg Dating is a "VR4two" project. 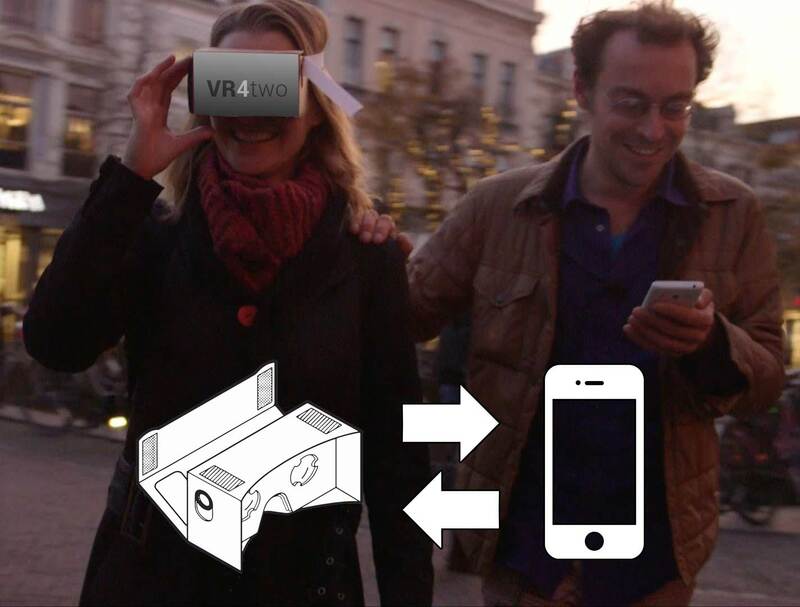 One person wears a Google Cardboard, the other person holds his/her smartphone which is connected to the VR world. 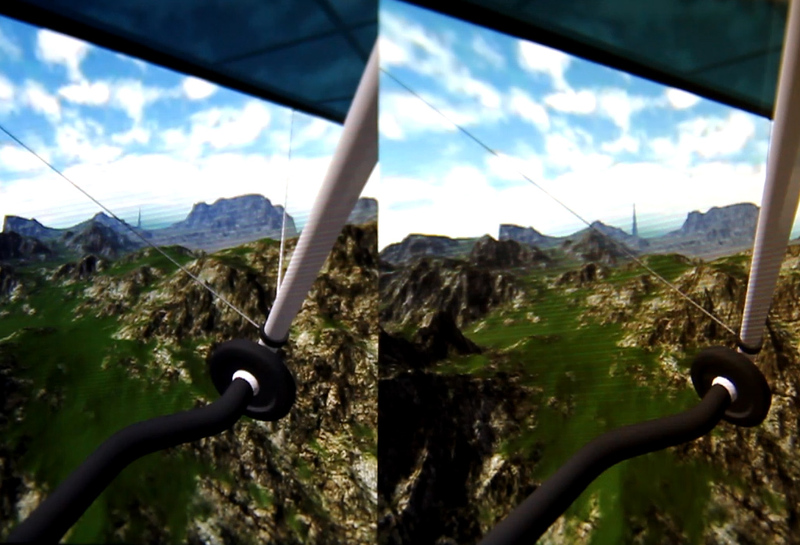 Movement through the parallel virtual reality is based on GPS-detection. At certain hotspots, interactions occur between the two people. In this case, the story of a date unfolds. New experiment! Try it a the Dutch Design Week in October. Bored with public transportation? 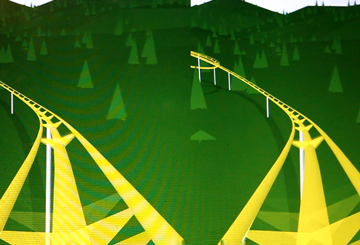 Bored with the unavoidable VR rollercoaster? Both issues solved at once! How to experience portable VR? The solution for nerds only: Turning your Oculus Rift DK2 into a portable device! 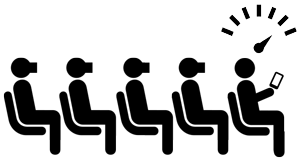 By now we have all had at least one hands-on experience with the new emergent characters of the cities we live in. 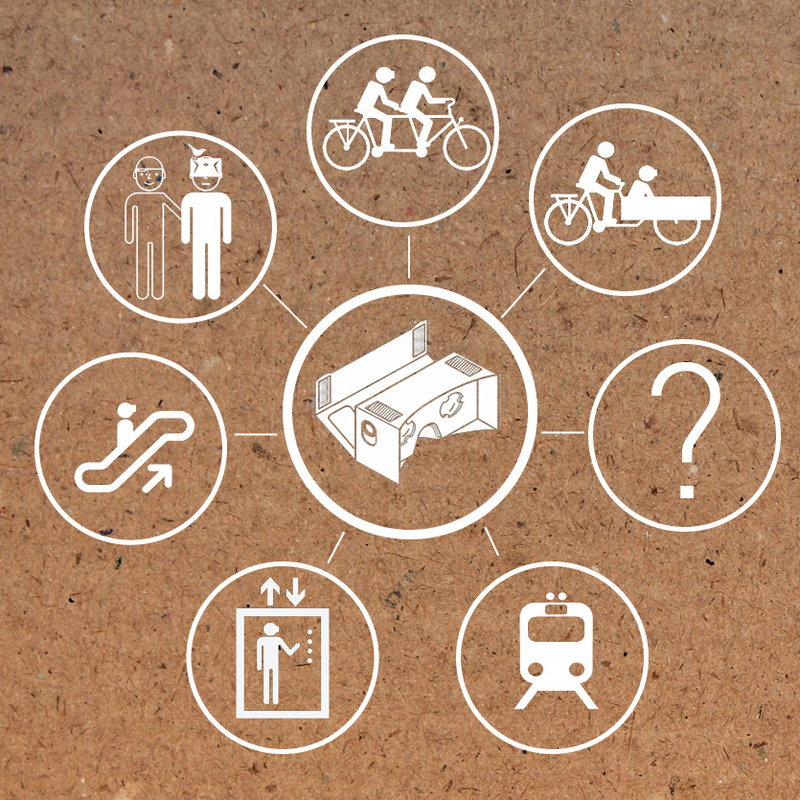 Smartphones and other wearables provide us with an interface to cities we inhabit or visit. 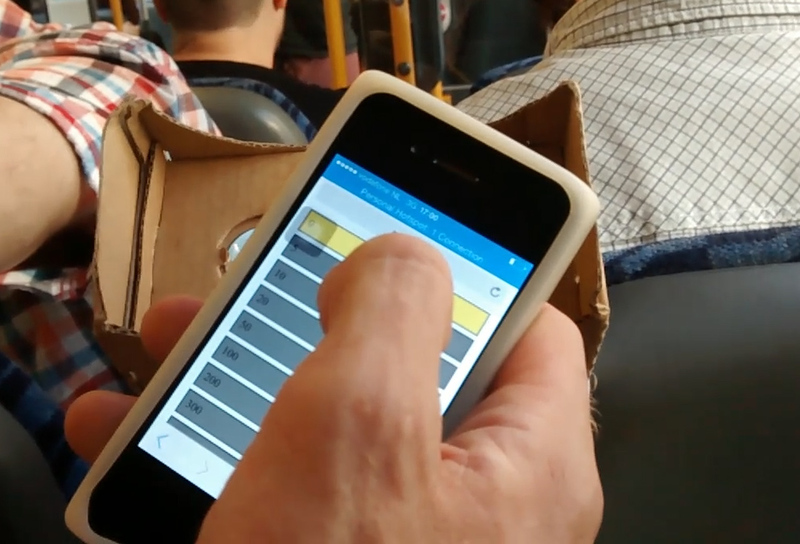 We can find a restaurant, order a taxi check or first read reviews submitted to the (local) cloud by other people. The massively adopted smartphone gives people access to a parallel data world, everywhere, and the interface is more than a one-way flow of data. It acts as a two-way mechanism. The interfaces to our cities are evolving rapidly. Futurists have been talking for long about how augmented reality technology adds a digital layer to our physical world which can be adapted by anyone, not just by commercial companies. We can shape our personal surroundings the way we want it, share it with others and thereby re-purpose physical objects and even locations. With "AR" an ideal world was looming at the horizon. It was going to combine the best of both worlds: retaining the benefits of our physical surrounding but adding a digital contextual layer to empower autonomous and independent control of our environment through data-driven interactions. Unfortunately, augmented reality is being abandoned before it has even reached its full potential because of a variety of reasons. An endless amount of incompatible augmented reality apps was the cause that AR never reached a global unified massive audience, so none of the augmented parallel realities achieved to have a relevant impact on city life. But fore mostly, proper and impactfull AR is difficult to create and therefore scarce. A technique with less risks of a failed user experience is virtual reality. Although its origin dates back decades ago, a recent hardware innovation by the VR company Oculus Rift has stirred the tech world and numerous similar devices are now rapidly changing the rest of the world. Although fundamentally different, VR is being seen as the next step in the directions of living digitally mediated lives. VR offers total immersion, realistic and flawless visualizations without having to deal with real world annoyances, which is unavoidably part of AR projects. Being independent of a physical location is seen as a benefit of VR over AR, instead of a step back. An Oculus Rift headset allows viewers to step into 3D worlds or ultra realistic 360 (live) video recordings of places anywhere on earth. People are invited to sit at home to experience the world. In the eyes of early adopters of AR who envisioned a semi-digital life for everyone, the VR revolution is a doom scenario, but there's away out! And it comes from those who are approaching the VR world with an augmented reality perspective. The solution is both easy and difficult: taking VR to the streets, which is a challenge. Leaving your living room in favor of experiencing VR in public space, leads to a different kind of immersive VR with unique added values when compared to 'normal' VR. No hardware could simulate a virtual reality experience enriched with natural characteristics unique to our physical world. 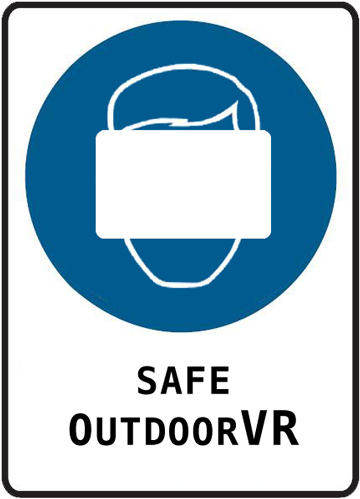 OutdoorVR encourages people to walk out the door wearing a VR-headset, breathe the fresh air and enjoy a natural ambient soundscape while taking a stroll through a virtual forest situated in the centre of a city, for example. The portable Google Cardboard VR device is perfect for this purpose. Some obvious problems need to be solved. A virtual reality headset fully blocks the perception of your surroundings. Seeing people wearing VR headsets in public space might at first sight look like a shift towards an even more individualistic urban space, but exploring VR outdoors requires two people. It becomes a social and collaborative task. Assistance by another person is needed, because no combination of hardware and sensors will ever provide a 100% safe outdoor VR experience. Besides the physical aspect of making VR more spectacular when traversing through it by foot, a guide can be instructed to read semi-scripted pieces of conversation or information from his/her synchronized and connected smartphone. With a mechanism as proposed and explored in Outdoor VR projects, the city space could be the host of multiple parallel universes, with purposes ranging from location-based storytelling to re-imagining specific city spots. 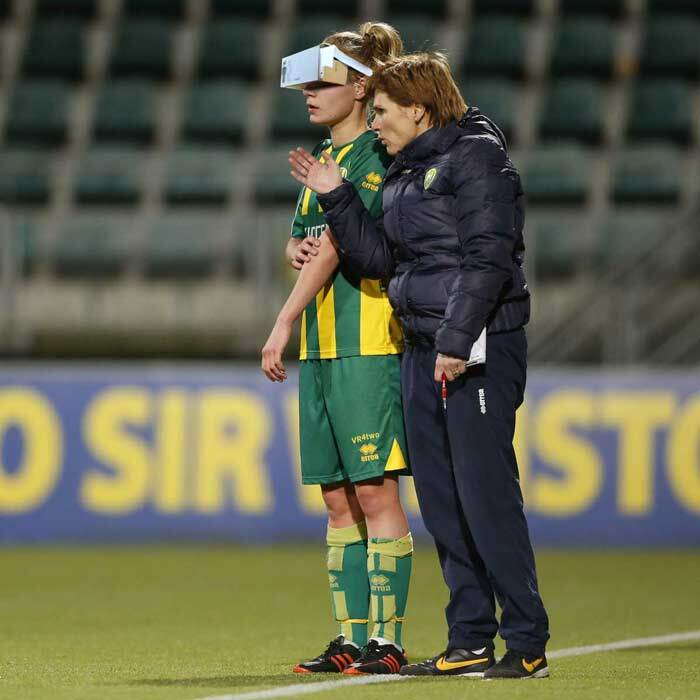 If you spot a good match between a portable VR app and the right circumstances in physical reality, provide the information or document it on Youtube and contact us so your contribution can be listed on this page. Notice: we're trying to look beyond hi-tech hardware solutions. Don't overestimate the power of hardware, cameras and sensors and don't underestimate the value of human guidance through the hybrid cities of the future.